Special thanks to Paulette for snapping my photos! While I sift through the many photos from Miami Swim Fashion Week, please enjoy this more casual office look, in which I took two of my current closet staples (a printed peplum top and a cotton twill collared shirt) and layered them. I know, not exactly rocket science over here but hey, I was pretty pleased with the outcome! And something tells me my new friend behind me here liked it, too! This is definitely adorable. I love more dressy pieces toned down..nice! love your peplum version ! really nice ! That print is beautiful! You're ever so creative with your styling, Krystal! Great idea, love how you've layered the shirt and peplum top! I never would have thought to wear it like that, very cute! I've been thinking about rocking the peplum top with a collar shirt underneath it. I'm glad to see someone doing it so that it can give me a vision of what it can look like. LOVE that bag. this looks FAB!!! and am now kicking myself for not picking up that rhinestone collar necklace when i saw it at f21! I love the layering you rocket scientist fashion girl! So happy you had a great time in Miami, & hope you return real soon! I think there's not an outfit I'm not loving on this blog! And this look is great as well! Really gorgeous outfit!! Love the floral peplum. 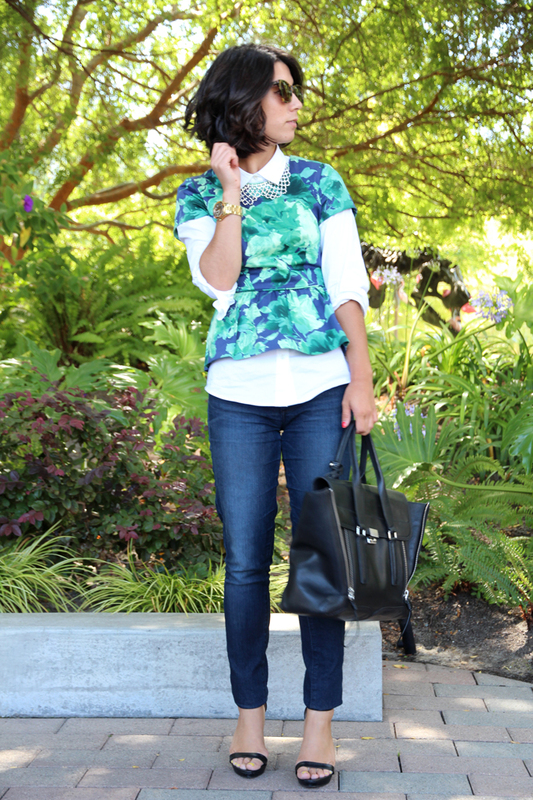 Oh my goodness, I absolutely love your tropical peplum and how you styled it! What a great idea... Simple, yet oh so chic. Love it! I've been admiring that blouse forever, but you really create an original look with it! Love the necklace, definitely a fun piece! Every time I see that J.Crew peplum, I regret not picking it up. It looks great on you! I think it is quite the original pairing! You look fabulous, as always! Love this layered combo! A peplum and a collar...who'da thunk it! Very cute! Really love the result, so original from you, i've never seen anyone wearing a peplum like in your outfit! What an amazing mix you have come up with! I love it! I love the combo, great idea! Never thought of wearing a collar with a peplum. Great look! 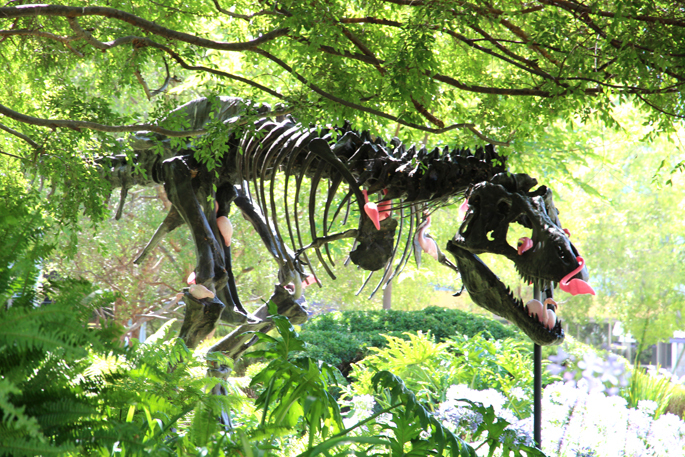 P.S That T Rex is hilarious, I want one in my garden. I want the peplum top desperately! Love it! how fun. i love trex! Just found your beautiful blog! Love this outfit! Lovely. I really like the layered tops. LOve the layers, amazingly mixed! Creative and fun! Love the look! loving the layered tops! 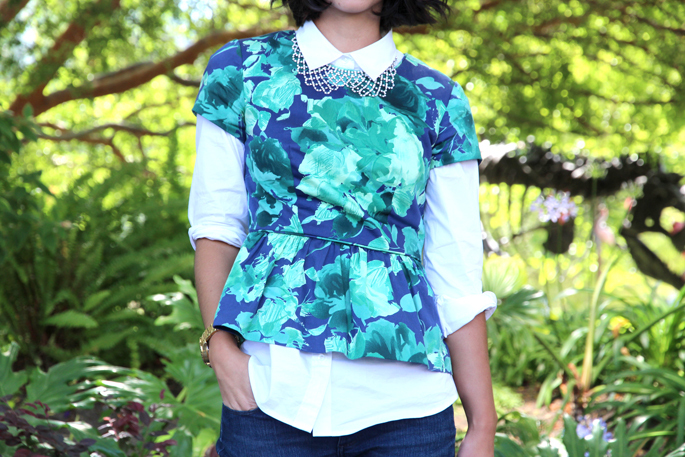 I honestly would have never imagined a collared shirt and peplum together to this is new to me! Uwielbiam twojego bloga. Jest dla mnie numerem 1. Obserwuje go już od kilku miesięcy. Jest dla mnie ogromną inspiracją. Gratuluję. Love this idea! Layering perfection.